Biomedical laboratories, entrepreneurs, and researchers need data to develop medical therapies. But the complex experiments the process requires can be error-prone, often leading to longer timelines and higher costs. 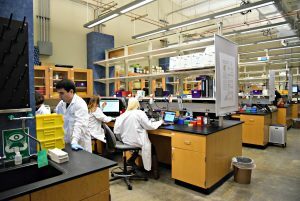 Now, a team led by UW electrical engineering Professor Eric Klavins will expand UW’s powerful BIOFAB, opening a full-service laboratory that will provide anyone with a laptop, whether undergraduate or faculty, access to full-scale molecular biology and cell engineering resources, and at a reasonable cost. Users will be able to design custom mammalian cell lines, develop experimental workflows to assay them, view and analyze data and execute experiments, all from the comfort of a coffee shop.